2 What is the compressor oil? 2.2 What kind of air compressor oil types do I need? 2.7 How to Change Air Compressor Oil? 2.9.1 #1. What kind of oil should I put in my car? 2.9.2 #2. What weight oil should I use? 2.9.3 #3. How to add oil to an air compressor? 2.9.4 #4. 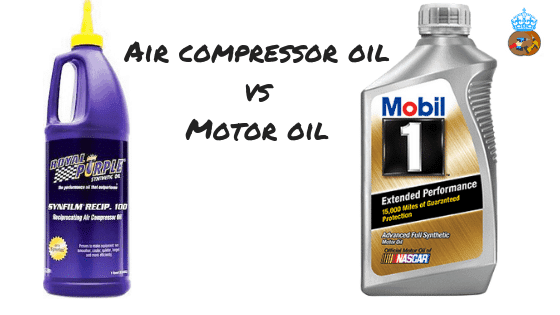 Can I use motor oil in my air compressor? 2.9.5 #5. How much compressor oil do I need? 2.9.6 #6. What kind of oil for air tools? 2.9.7 #7. Where can I buy synthetic oil? Air compressor is a day to day tool for every automotive enthusiast. But what turns out to worries about is- maintaining a good performance level and lifespan of them. And we leave no stone unturned to find the right lubricant to put an end to this struggle. Talking about the lubricants, one of the best practices is to use synthetic oils for air compressors. But a challenge that comes with it is to find the best synthetic air compressor oil. So the common questions are: what kind of oil do I need/what oil I should use? Because there are both fully synthetic and 100 synthetic oils in the market, each of them comes with some sub-types. Summary line? Choosing the right synthetic oil is way too hectic and confusing. Worry not; this guide is wholly crafted to give you a firm idea on what the best models are, and how to choose the right one for you. Take a cup of coffee, sit back and go through the whole article we’ve written. Hopefully, you’ll be back to us once again, thanking for the recommended oil for an air compressor. Presenting the #1 ranked best synthetic air compressor oil of the market- the Royal Purple 01513 Synfilm Recip. Its high-performance oil made solely for heavyweight motor and air compressor uses. It works as a lubricant, a wear-resistor, a temperature conductor and friction reducer. In one word- it’s a 360-degree solution to enhance the performance of your compressor. Can be applied easily with the pointy nozzle. It’s compatible and can be mixed with other compressor oils. Runs for a more extended period. It has a high filming strength of 100. The formula is curates by Royal Purple’s technology. It can rapidly separate from water. Resists wearing out and noise. Reduces friction by a great extent. Need a few maintenances to keep it in good condition. Royal Purple has done some significant wonder in formulating this air compressor oil. It’s formulated with the brand’s proprietary synerlec technology. And the technology itself is proven to run your compressor smoother, quieter, cooler and more extended. We’ve gone through many of the famous air compressor oils so far, but we’ve not seen so many of them with an easy-to-apply physique. But this model here has a pointy tip that makes it super easy to apply. You don’t need to get any additional nozzle or anything likely to use it right away. You may not hear about it quite often, but the filming strength is one of the sole properties that define the quality of an air compressor oil. This oil from Royal Purple has a good grade of it, which is all good for the health of your air compressor. One of the most exceptional signs of its effectiveness is, it’s good at keeping the carbon buildups away. Also, it reduces the friction force by a reasonable extent, which eventually deduces the internal wears. The amount of oil you need each time is highly minimal. So, we can say that it’s one of the cost-effective oils with good promise of quality. On an additional note, this oil is best performed with reciprocating air compressors which are of piston type. Although it can be mixed with another sort for compressor oils, we highly recommend you to use this lubricant solely on your compressor. Indeed, you’ll be happy with its performance, and it will be the last brand you’ll stick to. No matter you have portable air compressors, a heavy-duty car air compressor or just any rotational device; you won’t be compromising with the quality of its oil. Beat the benefits of regular synthetic oil for your compressor with DEWALT D55001 Synthetic Compressor Oil, our #2nd pick of the list. As you know, DeWalt- the name itself is a promise of superb quality and excellent performance. On that same note, we’ve found rounds of applause from the users of this compressor oil. Premium grade protection for your pump. Helps to boost up the compressor efficiency. Deals with both low and high-temperature situations. Don’t let the carbon to build upon the valves. Enhances the lifespan of your compressor. Available in 4 different packages. A reasonable price for buyers of low budget. The bottle cap can’t be sealed once used. No matter you use an air compressor or vacuum pump, you won’t be compromising with the quality of performance and security for it. DEWALT D55001 is a 1-quart pack, made of premium grade synthetic material. In many cases, air compressors fail due to excessive temperature and the lubricant’s inability to eat that up. But DeWalt is aware of the situation and made this lubricant to work at even highest temperature a compressor system can reach. The main reason why we invest after synthetic air compressor oil is, we don’t want any carbon build up into the valves. This model serves us precisely with that. Wearing out parts is one of the common issues that every automotive owner hate. This oil will fully work on your favor and protest the wearing as much as possible. Once you fill your compressor up with this best synthetic air compressor oil, it will be good to go for the next 200 hours of operation. So, you’ll be free of the worries for almost and years. Dewalt itself is the guarantor of the air compressor we’ve just talked about. Starting from the protection, it provides lubrication, wearing-less function, a long-lasting lifetime of the compressor and so on. What do you think of this oil? While working with an air compressor in average temperature, nothing seems to be a hardship. But there are some cases where the compressor has to operate either at a shallow temperature (as -40-degree Celsius) or very high temperature as (240 degrees Celsius). If you’re one who has to face such situations very often, we’ve got a piece of good news for you. The air compressor oil we’ll be talking about now is a survivor at both high and low and of temperatures. This compressor oil is 100% synthetic oil. Provides 25% better protection to your compressor. Works more beautiful, and longer than any synthetic blend oils. Has a flash point temperature of 238-degree Celsius. Has a pour point temperature of -40 degree Celsius. It’s an all-season compressor oil. It’s available in 4 different sizes. The price point seems to be little over the reach of the mid-range budget. And the name is Powermate Px P018-0084SP. Let’s hover into the more detailed insight of its features. This great Powermate Px P018-0084SP is proven to provide 25% more protection compared to other brands. And that’s probably the best feature we’ve found in this newly launched product. Powermate Px P018-0084SP is highly compatible to keep your compressor running smoothly even in cold temperatures. To be specific, it can start 10 degrees colder comparing to many other synthetic air compressor oils. Another excellent quality of this lubricant is, it’s an all-season compressor oil. No matter its chilly winter or hot summer, it will take care of your air compressor in an equally good manner. We’ve seen many brands to claim a proper operating temperature. But this one here actually does that. As long as we’ve seen, it has a flash point of 238 degrees Celsius, and a pour point of -40 degree Celsius. You can efficiently operate your air compressor in between any temperature range with this oil. As per your essence, you can choose from the four packages that the product is offered with. There is a pack of 2, 3, 4 and 1. Although Powermate Px P018-0084SP would cost you a few extra bucks, running your air compressor at extraordinarily high or low temperature may worth it. This compressor is a perfect fit for chilly winter and hot summer, and every other temperature in between. Hopefully, you’ll be happy with the quality of this oil. What is the compressor oil? No matter you have an automobile vehicle or you run a high-performance internal combustion engine, you need to keep the air compressor smooth. To do that, the kit we use almost every time is the air compressor oil. Air compressor oil is a chemical solution formulated from highly refined additives and paraffinic base. The purpose of this solution is to produce lubrication, resistance from friction, diminishing the noise and enhance the performance of an air compressor. There are many ISO viscosity grades to define variations of air compressor oils at different extents. But the sole purpose of all of them is the same. No matter whatever the application is, air compressor oils are a must-to-have part of the whole compressor system. It has some uses, each impacting on the overall performance of the compressor. This property of air compressor oils helps to reduce the deposit of carbon. Also, deduced the amount of oxidation and thermal degradation helps to enhance the lifetime of the compressor. Again, air compressor oils are good at reducing the wear. And that eventually enhances the lifetime of the compressor. Also, you have to do the least amount of maintenance works in this way. No one wants his air compressor to be blown away by corrosion and rust. A good quality air compressor might be your companion right there. Rapid release of foam and air from the combustion chamber helps with the lifespan of the components. It helps to aerate the ingredients and to prevent cavitations damage to it. Carryover to down strip equipment may leave into a severe impact on the performance of the air compressor. And good quality oil helps to deduce that. 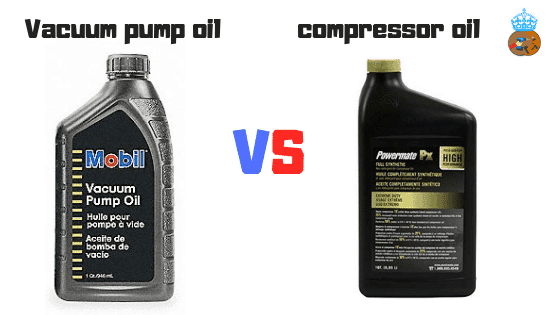 What kind of air compressor oil types do I need? When you are up to find the best air compressor oil to use, you’ll be blown up with hundreds of options ahead of you. It’s such a chore and to see the right one needs some expert hand. The type of air compressor that you should use massively depends on the standard and synthetic blend of the product. From manufacturer to manufacturer, they vary a lot. But typically, the ideal recommendation is to use oils with 20 weights or 30 weights. Both of them are of a non-detergent type. Also, there are intense debates as well as misconceptions among motor oil vs. compressor oil, synthetic oil vs. non-synthetic oil and so on. However, we have got some head to head comparison of different kind of oils and lubricants. Go through the points below and get a complete idea of what type of air compressor oil you should use. We’ve seen many new users use motor oils into their air compressor, which is entirely wrong. Compressor oils are specially designed for air compressors, where motor oils are for motors of trucks, cars, etc. Motor oil contains some detergent actually in it. And that’s because such ingredients are helpful for the internal combustion, which motors have to deal with a lot. But a compressor doesn’t have any such necessity. Presence of detergent causes a build-up of carbon, which is eventually bad for the health of the air compressor. Moving forward, using motor oil in your air compressor may ruin the warranty of your compressor. Usually, when the manufacturers find that you are using non-standard motor oil in your compressor, they deny providing the warranty or guaranty. Our last advice is to avoid any motor oils or oils that contain detergent in them for your air compressor. Non-detergent air compressor oils are of 20 to 30w, and they are available in any local auto parts store. If your thought is to buy only one oil for the whole automobile (motor, air compressor, etc. ), then we would insist on reconsidering your opinion. Each of the parts has its demands. And you as the owner have to hear that up. Now, we have to disclose the debate between standard air compressor oil and synthetic compressor oil. Both of them are widely is used for air compressors. But in action, they have their features that you should be aware of. The fact that matters while choosing between standard and synthetic air compressor is- how often you are using them on your compressor. A standard compressor would be okay to use for cases where the air compressor isn’t in use a lot. For occasionally used compressors, they are occupied in a mid and light level of workloads, and the working hours are not even high. So, conventional compressors oil will be just fine. Now, come to the point of synthetic air compressor oils. As you know, the price point of synthetic air compressor is way higher than standard oils. So, the case of uses should have enough reasons to worth such an investment. What we are trying to say is, synthetic air compressor oil is for professional cases where the frequency of using air compressor is too high. By the word ‘too high,’ we mean that at least thrice a week. Good quality synthetic compressor oil should be there to provide better protection from overheating, and lubrication. Also, synthetic air compressor oils are likely to have a broader range of temperature when your compressor is running under cold temperature. Also, synthetic compressors are likely to provide smoother operation as long as long-lasting performance. According to many users’ perspectives, synthetic air compressor oils are better regarding performance and accuracy. We’ve got a lot of questions posted on forums about the difference between 100 synthetic oil and fully synthetic oil. In this section, we are going to showcase the difference between them. By 100 synthetic oil or 100% synthetic oil, there develops new compounds or molecules. They are capable of providing better lubrication, more protection and more resistance to the pressure that builds up inside your air compressor. A manufacturer, who develops 100 synthetic oils, can control the quality of each of the drops of the oil. The quality of the oil is refined and contains the same class as mineral based oil. Some of my favorite 100% synthetic oils are the Motul’s High Tech 8100 and 300V ranges. In this model, each of the drops of the oil is purely synthesized. Fully synthetic oil in the other hand is just the regular synthetic oil that you get to find in any market. They are good so far. But there are some drawbacks if you compare them with 100 synthetic oils. First thing first, there is no strict regulation or definition of what we call ‘fully synthetic oil.’ There are many cases where the companies claim to make fully synthetic oils but what they do is just highly refined synthesize the raw materials. You have to pay some severe number of bucks when you’re up for buying fully synthetic oils. But what you end up with may not be adequately synthesized oil at all. The fully synthesized oils have a percentage with them, which is not often disclosed. In most cases, they are like 90%, 60% or even 2% synthetic. And the more serious problem is, you don’t know this actual number. You may have heard to use the term ‘compressor and vacuum lubricant’ quite often. The fact is, many companies treat these two types of lubricant oils as one. But actually, they are not. Vacuum pump oil is usually, made out of a high-performance mineral base. The formula or this oil contains an excellent grade of anti-wearing properties. So, the induce proper lubrication among the parts of a vacuum pump. They also secure the vacuum pumps with long lasting durability and protection from corrosion and rust. Vacuum pump oils are also known for their property of containing anti-oxidants. This is impactful when it comes to enhancing the service life of the lubricants. As a result, you don’t have to use lubricants frequently to get the best performance out of your vacuum pump. Air compressor oils in the other hands are manufactured to reduce the carbon buildup in between the compressor valves. Which eventually, results in a long-lasting air compressor? There are many variations of air compressor oils regarding viscosity, organic chemicals, and so on. 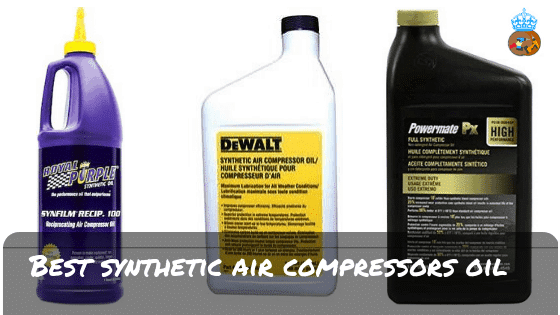 In this post, you can already see some variations of air compressor oils. And choosing the right one from them takes a toll of long-lasting research. However, the best kind of air compressor oil is known as synthetic oils, and that’s what we are talking about throughout the whole post. How to Change Air Compressor Oil? Once you get the best synthetic air compressor in hands, it’s time to change that with the previously put oil. However, we will take you through a set of steps on how to do that. Your first duty is to find where the drain plug is. Also, there can be any obstacles throughout the way of the draining process. You have to locate that as well. If you don’t do so, the whole process of draining can turn into a mess. Already there can be the presence of precvio9usly put air compressor oil. Find a bottle or something to collect that and empty up the whole inside. Also, you can do that with a drain pan or small container. While draining the oil out, secure the position of the drain plug and drain pan. In some of the compressors, you may need to hold the other end of them as well. Once the draining process is done, put back the drain plug into its position. The third step is to locate the fill cap and refill the compressor with the new oil. You can take help of a small funnel to do that, and that will prevent slipping off oils. Remember, you are advised to refill the air compressor as per the instructor’s manual. So, make sure to have a firm idea about that. While doing the refill, keep an eye on the fill level to check whether it has got sufficient amount of oil or not. Make sure that you don’t refill the oil at an excessive level. There are many uses of used air compressor oil. Once you’re done with filling up your compressor with the new oil, ask at the local auto parts shop for whether they have any way to recycle the old compressor oil or not. Once done, you’re good with the whole changing process. Although, we are not recommending you to use anything else instead of air compressor oils. But there have been a lot of places where people are getting over with using so. Mainly, for portable air compressors, many engineers use automotive transmission fluid, also known as ATF. Automatic Transmission Fluids (ATF) is a kind of lubricant used in industrial-grade automobiles. Many properties in ATFs suit the necessity of a compressor fluid as well. For example, in an automotive system, the ATF performs the task of lubricating, cooling parts, keeping the deposits away, play the role of a hydraulic medium, and reduce friction forces among elements. You may already see similarities between what air compressor oil can do, and what ATF does. But there are some drawbacks as well. If you use ATF instead of compressor oil, there is a good chance of incompatibility between the existing lubricant and the newly put ATF. Also, the can cause additive issues if your compressor is not portable type. So, we would recommend you to consult with an expert before getting such air compressor oil substitutes in use. #1. What kind of oil should I put in my car? Answer: Cars have delicate parts and operations that are needed to be taken care of with maximum protection. So, we would recommend you to for synthetic oil for the air compressor of your car. If possible, get a 100% synthetic oil to receive the best kind of performance. #2. What weight oil should I use? Answer: Air compressor oils are of 20 and 30 weights, in most cases. And the choice of one between these two depends on what type of works your compressor occupied with. If it’s lightweight applications, 20 weighing air compressors are excellent. For heavier applications, we would recommend 30 weights. #3. How to add oil to an air compressor? Answer: To add the air compressor on replacing the old ones, you have to drain out the old oil first. And then, with the help of a funnel, you can put the new oil in the compressor. Once done, seal the compressor drain again. #4. Can I use motor oil in my air compressor? #5. How much compressor oil do I need? Answer: This answer varies from cases to cases. There are many cases where a portable air compressor can get done with just 4oz of air compressor oil. And there are some industrial cases where you need to put more than 100oz of air compressor oil to keep the system running. #6. What kind of oil for air tools? Answer: Air tools may need lubrication up to a certain extent. To keep them on the run, we would recommend you to use a high graded synthetic air compressor or motor oil on them. #7. Where can I buy synthetic oil? Answer: Air compressor oil is a pretty much common item in any auto parts store. You can avail popular models from there. But if you’re looking forward to moving one step further with the quality of the compressor oil, we would recommend using branded oils. Our recommended oil for the air compressor is available in online stores like Amazon, eBay, etc. Some brands offer retail services on their own. So, that’s the end of today’s best synthetic air compressor oil reviews for the year 2019. We’ve mainly talked about synthetic oils because this is the best kind of practice to use those on your compressor. The only fact that’s left unsolved is choosing the right one from a list of them. And hopefully, this guide will be the support center of yours to do that.